Chicken breasts marinated in cinnamon sugar butter, then coated with salty sliced almonds. 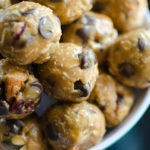 Served over a smear of cashew butter and topped with a sprinkling of roasted cranberries. 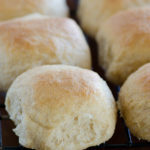 This recipe post is sponsored by The J.M. Smucker Company as part of their “Mixing Up Mealtime” Campaign. 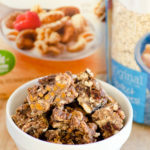 Thank you for allowing me to talk about products I believe in, so I can continue this little blog of mine and bring you more fun recipes and ideas! Man, what a recipe title! Sounds sort of odd, huh? Trust me, the flavors go together and become what you would expect for a fall medley. I love peanut butter. Call me crazy, but peanut butter toast is one of my favorite foods. In fact, I just ate it for breakfast this morning with a big glass of cold milk. Yum. 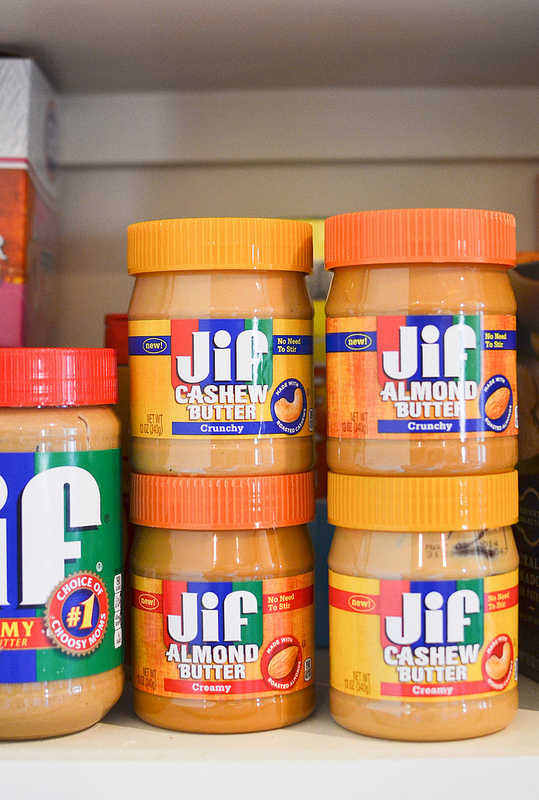 When I buy peanut butter, I’m one of those “choosy” moms who choose Jif. I’m not plugging their well-known motto because I’m being told to. Instead, I’m admitting that this is the mom I am. Most other products I can go with a generic store brand or switch it up based upon what’s on sale. 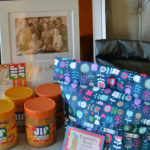 But, for peanut butter, it’s always Jif in my basket. Ha! So, when The J.M. Smucker Company offered to send me their new line of Jif Almond and Cashew Butters, then asked to develop a recipe for them, it wasn’t hard to say “YES!”. This recipe isn’t exactly one that you want your kids helping too much with, as it involves touching raw chicken. But, you can always find something for them to do. In this case, assign them to smear the cashew butter on the plate before you place the cooked chicken breast on top. It doesn’t matter how imperfect the slab of butter is, because it will be hidden by the chicken, but your kids will get a kick out of doing it. Then, let them sprinkle the (cooled) roasted cranberries over top! 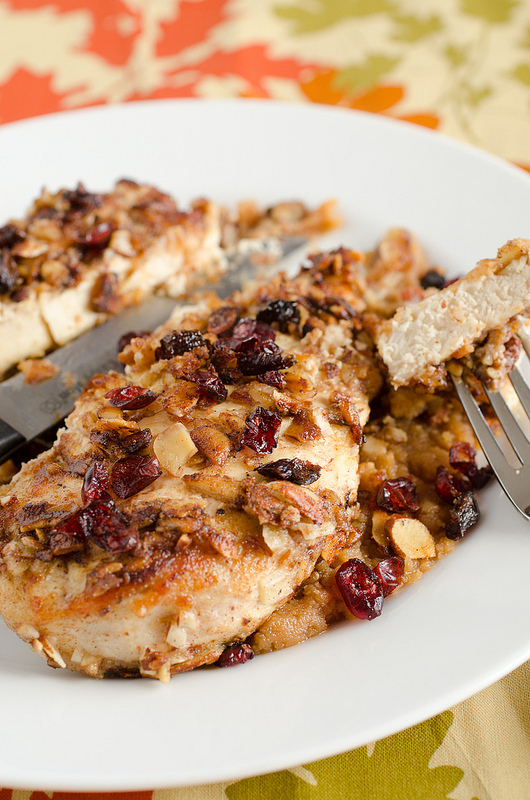 The pounded out chicken breasts are dipped in a cinnamon sugar butter, then crusted with sliced almonds. I think cooked them in a skillet for 5-7 minutes each side, being careful not to burn the almonds. 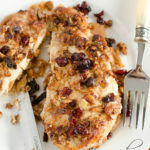 Each chicken breast is then placed on a slab of cashew butter and then topped with the roasted cranberries. When eating, make sure each bite incorporates every ingredients to get the full fall flavor. Fall flavors incorporated into an almond crusted chicken, atop a smearing of cashew butter. Preheat oven to 400 degrees F. Line a baking sheet with parchment paper and spread the cranberries evenly on the pan in one layer. Bake until the juices just burst, about 5-7 minutes. Set aside. Toss the sliced almonds and flour together into a large shallow dish or pie plate. In another glass pie plate, melt the butter in the microwave. Remove from the microwave and stir in the sugar and cinnamon. Place the two chicken breasts in a large zipper locked bag. Seal the bag, then use either a rolling pin or meat mallet to pound the chicken until thinned to about half inch thickness. Dip each chicken breast first into the cinnamon sugar butter, then into the sliced almonds, coating both sides. Heat about 2 tablespoons of oil in a large skillet over medium heat. Cook the chicken for 5-7 minutes on each side, flipping after about 3 minutes at a time. Meanwhile, in a small saucepan, mix together the cashew butter and cayenne pepper. Heat over low heat until melted and warm. Stir in the Greek yogurt and continue to cook until glossy and thick. Remove from the heat and spread half of the cashew butter onto each serving plate. 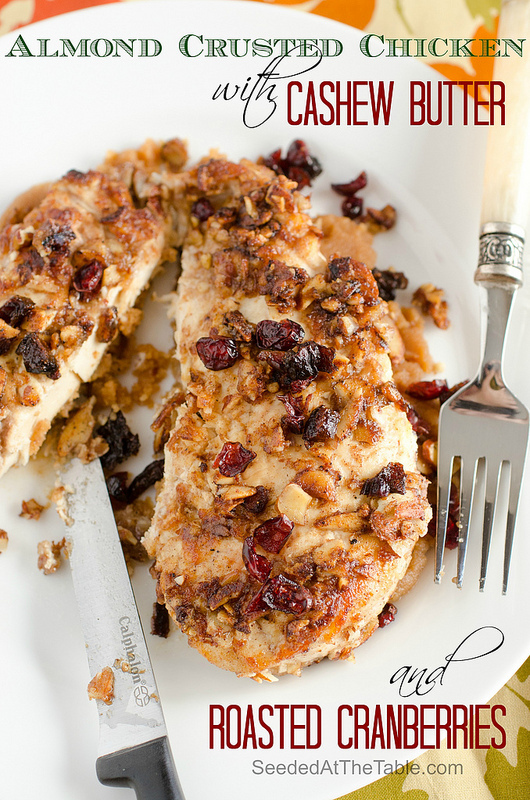 Place the chicken breast on top, then sprinkle with the roasted cranberries. For more mealtime inspiration, visit Jif at their website, Facebook page and Pinterest. 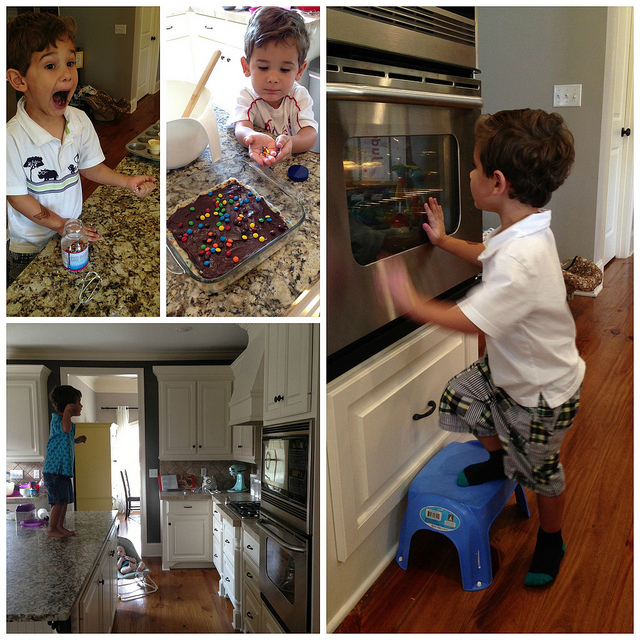 Please don’t let your little boy stand on your counter tops. It isn’t sanitary or safe for him. The recipe does sound good.